Meal Bins are the perfect solution for storing meal on the farm. They are easily transported with a bale handler and are ideally sited close to the feeding location in the field. The amount of labour and time involved in feeding as a result is significantly reduced for the farmer. 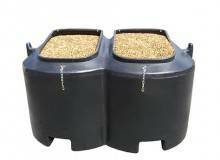 Strong and durable feed storage bin with a low profile for ease of access when filling and empting. Designed to fit in a standard car trailer (2.5 x 1.2m). Can be easily transported by a forklift or bale handler. 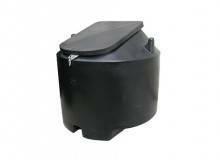 Strong and durable feed storage bin with a wide opening at the top and lockable lid. Fitted with a drain-off (25mm) for ease of cleaning and emptying.